Do you have friends who had a baby first, then married later? We do. No judgment! On occasion, though, we’ve found ourselves stumped as to the “perfect” wedding gift—one that was stylish, practical and child-friendly. No longer. If a budding young family likes to eat, you’re in luck.At a recent culinary product showcase held at Astor Center, I learned that Zwilling J.A. Henckels Flatware has rolled out a kids flatware line. Designed for tiny hands (ages 3 to 6 years), a 4-piece 18/10 stainless steel place setting includes a child’s fork, knife, large and small spoon. You can choose from four series: “Bino”, adorned with playful animals; “Filou” with plain, softly rounded handles, ideal for engraving a child’s name or initials; “Teddy” with Teddy bears handles; and “Grimm” with handle designs based on Grimm fairly tales, like Little Red Riding Hood and The Princess and the Frog. 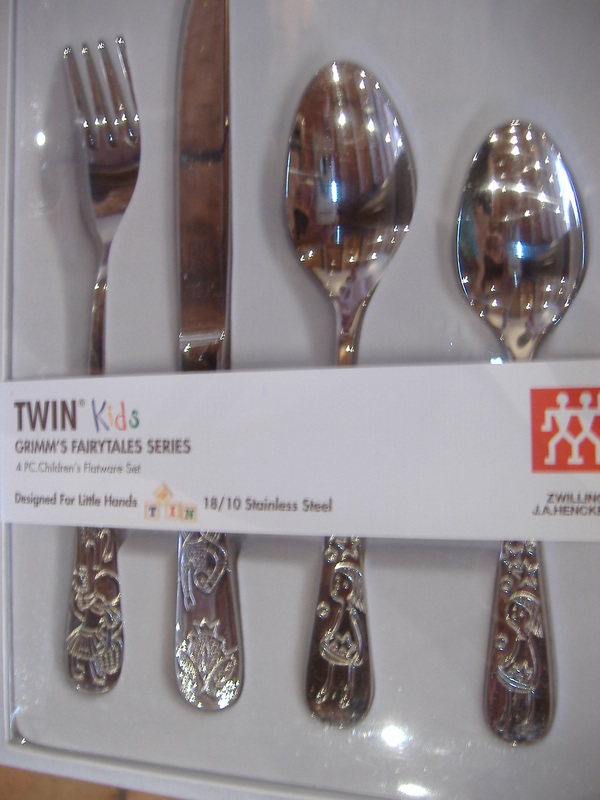 The children’s flatware lines debut later this month. Priced at $19.99 for one 4-piece set, they will be available in specialty gourmet and gift stores and through e-tailers. This entry was posted in Culinary Products and tagged culinary products, flatware, kids' flatware, Zwilling J.A. Henckels. Bookmark the permalink.